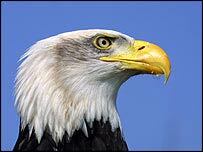 Police are warning people not to approach a bald eagle that escaped during a display at the weekend. The 14-year-old bird named Alaska flew off at around lunchtime on Sunday, during a display at Eagle Heights Bird of Prey Centre in Dartford, Kent. Alaska has a massive wing span of around two metres and although her owners describe her as "friendly" she could pose a threat if confronted. The 4.5 kg bird of prey has lived at the centre since she was six months old and her owner Alain Aimes says he is desperate to get her back. "In the wind she was able to go up a couple of thousand feet," he said. "That's normal, but this time she did not return. She just took off." Experts say Alaska could have flown as far as north-east London, Essex or Suffolk.